I know not everyone likes Valentine's Day and I understand it's very commercial but I'm a sucker for an excuse to receive gifts. There is nothing stopping you gifting to yourself. This little list of ideas has purely been generated from scouring the internet and looking for items I might like to receive. Relax and Unwind with the beautiful Lola's Apothecary Delicate Romance Bath & Shower Oil. A luxury treat which I'm sure delights the sense and looks very elegant in the bathroom. Sticking with aromatherapy theme then I think the Scentered Love Therapy Balm would make a nice gift. Instead of buying roses perhaps rose scented skincare could be an option. It's a gift that would last for many weeks. You could chose products like Balm Balm Rose Geranium Natural Perfume, Odylique Timeless Rose Moisturiser and Botanicals Wild Rose Nourishing Body Balm - all of which are available from Love Lula. Candles can create a romantic setting and fragrance a room. I always recommend opting for brands that use eco-friendly wax such as soy and avoid artificial scents. Take a look at Nula Soy and Nathalie Bond. 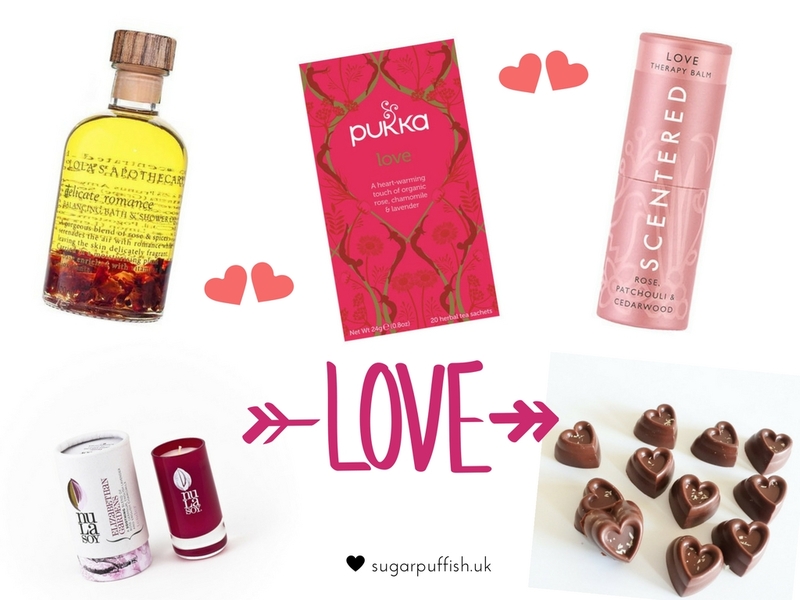 If your sweetheart is a lover of tea then Pukka Love seems like the perfect romantic treat. How about pairing with cute heart shapes vegan chocolates that I found via Etsy. Eco friendly trinkets are perfect for those who want to be thoughtful about the environment. I've chosen sea glass keyrings with a hand carve heart from Etsy and a jewellery set made from coral shell (Little Isle of Wight Company). I'm becoming more interested in eco-friendly and sustainable clothing and with that in mind I picked out a lovely bamboo scarf from Thought (formerly Braintree Clothing) which is available in a variety of colours. Disclaimer - This post is not sponsored by the brands mentioned, contains affiliate links. I'd be thrilled with anything on this list, especially a new soy wax candle. I know not everyone enjoys Valentines but it irritates me when people use the "commercial" excuse. I guess those who don't celebrate this for those reasons also don't celebrate Christmas (the most commercial holiday going)? Bit hypocritical to me. Whether I have been single or in a relationship, I have always loved Valentines day.